Tea Collection’s Biggest Sale of the Season is Here! Starting right now, Tea Collection is kicking of the biggest sale of the season!! Oh, just in time for the holiday weekend! Take an extra 40% off of hundreds of sale items, including newly added styles! You don’t want to miss this!!! You can find knit dresses starting at just $10. Cool summer graphic tees as low as $7. As well as Tea Collection’s rompers, which truly are the easiest outfit ever, now $10 and up. Oh and we can’t forget about all the swim styles and accessories too! Tea Collection’s sale has all you need for your Summer’s adventures! Make sure to spread the news before the holiday weekend! The sale ends Tuesday, July 5th. 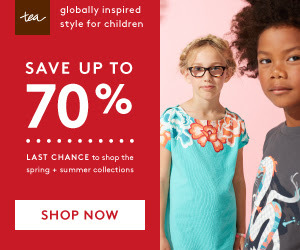 Enter code EXTRA40 during checkout to receive an extra 40% off summer sale prices at TeaCollection.com. Discount taken pre-tax. Offer expires at 11:59pm PT on 7/5/16. No adjustments on previous purchases. Not redeemable for cash. Terms of offer are subject to change.